Jerome Rothenberg [1931- ] has accomplished a good deal in his lifetime. Aside from being a unique and interesting poet himself, he's edited a series of anthologies highlighting not only the American avant garde, but the literatures of cultures around the world, linking the common efforts of writers from diverse backgrounds, over long stretches of time, and facilitating the cross-fertilization of ideas and forms across borders and barriers. But his beginnings were relatively humble, if, in retrospect, auspicious. One of my favorite poems from the post-War period is the lead (or "title") poem from his first, self-published, pamphlet, White Sun Black Sun [New York: Hawk's Well Press, 1960]. Published in the same year as the Allen Anthology, New American Poetry 1945-1960 [New York: Grove Press], it's only 30 pages long, and has a certain Germanic cast, with echoes of, for instance, the work of Paul Celan. A symbolic, deep imagery predominates. Ikonic "universals" are manipulated in dream-like sequences. There is no overt evidence here of the explorations of Jewish identity [Poland/1931, Unicorn Press, 1970], or the explorations of form [Conversations, Black Sparrow Press, 1968], or the interest in primitive/tribal cultural artifacts [The 17 Horse Songs of Frank Mitchell, Tetrad Press, 1969], which would characterize much of the work of his earlier period. Again, the driving influence seems to point to those German poets Rothenberg had translated [Young German Poets, City Lights Books, 1959]--Celan, Grass, Enzenberger--for Ferlinghetti's Pocket Poets Series. Poets' debut books often present either as ironic counterparts to their later careers, or as perfectly consistent prefigurements. Consider William Carlos Williams's first self-published book Poems [Rutherford, NJ, 1909], which, had you read it contemporaneously, would have held no clues whatever to his later accomplishments. Or Wallace Stevens's Harmonium [Knopf, 1923], published when he was in his early forties, which already feels triumphant in its mature command of materials--of which his later books seem almost an elaboration. Had Rothenberg not been the impatient, curious explorer, his career might have developed along fairly predictable lines. But the Sixties exploded a number of traditional modes of professional literary presumption. What kind of poet might Robert Bly have become, for instance, if he had not confronted militarism, the counterculture preoccupation with sexual identities, and the poetries of South America and the Middle East and Scandanavia? Silence in the Snowy Fields [Wesleyan, 1962] shares a number of concerns with Rothenberg's White Sun, though the divergent paths of their respective careers tells us not only how fragmented the poetry culture would become in America over the succeeding decades, but also how similar (and cohesive) the poetry scene had been at their mutual beginnings [circa 1955-59]. The careers of both these poets benefited from a wide exploration of different literatures, as well as investigations into personal history and psychology. But in 1960, this was all to come. them, and seemed composed of them. panion which was my eternal lot. That picks up crumbs around the door." Of our most holy mystery." Are such things done on Albion's shore? "Father, father, where are you going? Or else I shall be lost." Appeared like his father, in white. The little boy weeping sought. Nevertheless, the poem's rhythmic structure carries considerable force. Its chanting insistence in the repeated phrase at beginning and end, frames the imagery of overcoats, willows, cows and crickets. 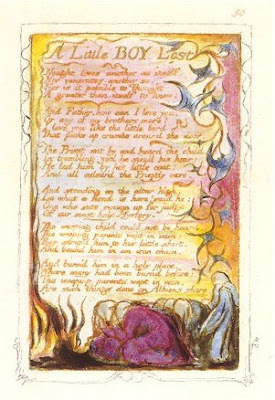 In terms of theme, Rothenberg's poem appears to play off of Blake's antinomy of innocence and experience in terms of dark and light/birth and death/city and country-- as if the speaker were trying to come to terms with the wildness of experience. 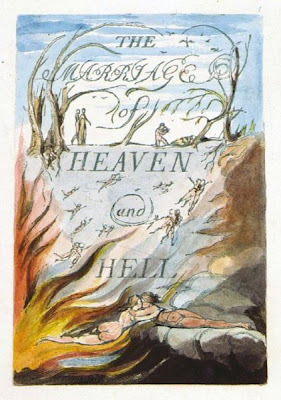 If the city is represented as "white" light, and the country as "dark"-ness, or dark light, it may also signify evil or chaos, much as, in Blake's poems, the "mire," in the "lonely dale." 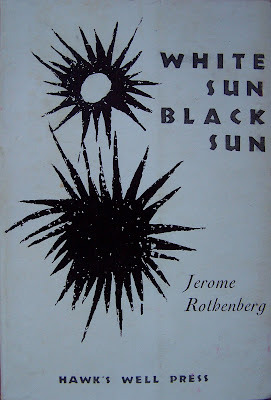 Rothenberg's poem seems also to recall or evoke a childhood dilemma, a feeling of being lost in the wilderness, not just the literal universal wilderness but the wilderness or chaos of mind, entangled in transgressive or confusing nets. Though the poem doesn't strike me as a religious dialectic, it could be interpreted, in that context, in a number of possible ways. If I had to choose an example of a poet whose annunciation of his life-task was as clear and persuasive as this one is, Rothenberg's would be near the top--as indicative, and convincing, in its way, as Eliot's Prufrock. A great beginning isn't crucial to the career of a writer, but it can be critically important, especially if it rings true. The final "no door" suggests a trap, a closed off space or room from which the poet cannot escape. But the poem, especially as the annunciatory entry into the clearing (Duncan) of verse, suggests a birthing as poet. The poem could be a metaphor for the sense of historical enjambment which Rothenberg feels as a Jew following the horrors of the Holocaust, the door a symbolic escape hatch from the fate of persecutions of race and ethnicity. As an American Jew, Rothenberg was in the crucial position of empathizing with the suppressed poetries (and peoples) of the Third World, and the many worlds (or rooms) he would explore in the ensuing years. Each door leads to the outer world, and each door to another room. An igloo is a teepee is a mud hut. Though the poem says "no door" it's actually the door--the road beyond. The poem is a door to the poet's future. HTML is the language for internet web pages. 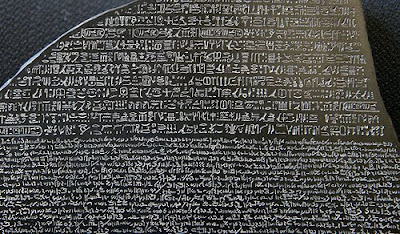 As such, it is not unlike the ancient Rosetta Stone, in that it provides an intermediary coded "text" which "translates" into a readable format (a "common tongue" language) as opposed to a jargon. Of course, without the technology of a "browser" such a translation doesn't happen. 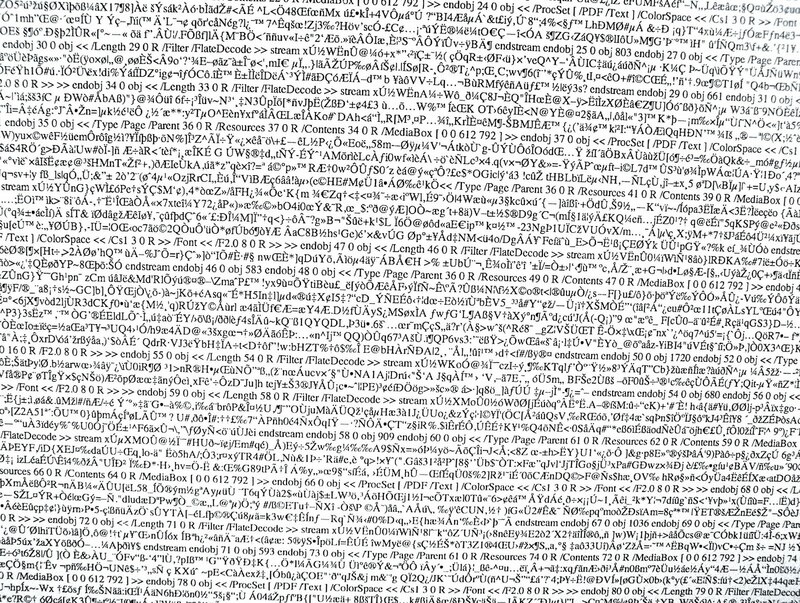 Could someone from an earlier culture--or, from one which had no knowledge of computer technology, untangle this code and make any kind of sense of it? Perhaps. Code-breaking can accomplish amazing feats. Perhaps one would need both the HTML and the corresponding readable portion of any given text to be able to "decipher" it. Perhaps the "browser" is a kind of code breaker. Being able to interpolate from one language to another is in fact a kind of translation. Translators of known languages face precisely this problem: How to know the corresponding underlying meanings of the signifiers, and then transfer this precipitate or alembic into an equivalent language. Indeed, though, referring to an underlying "code" as the metaphor for the "gist" of any written text, implies a third thing, i.e., the mental sense which thinkers/speakers have of something, through the screen of any given language. Can physicists "see" phenomena in terms of mathematical language? When Pasternak or Neruda or Szymborska or Rilke call a spade a spade, is it ever the same spade which English speakers like you and I perceive? We tend to think there are large or subtle differences in the way languages describe things, even if those languages are related (as with romance languages). As Frost said, poetry is that which cannot be translated, i.e., that which is "lost in translation." 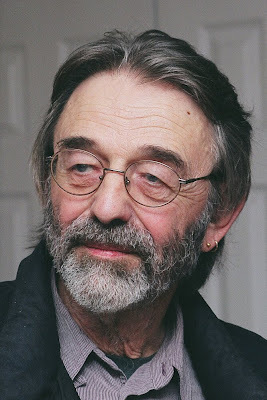 Is poetry a quality which develops with the immature mind, a process during which complex interrelationships and a deep familiarity are built up, a process which perhaps is difficult, at best, to replicate later in life, or in other ways? It may be possible for children to be raised as bi-lingual, but this process may be possible to certain individuals who retain the ability to acquire new language with great facility, throughout their lives--an aptitude that is not common at all. But is it possible to replicate the intimate familiarity which is acquired during the formative childhood years? It's a ponderable quandary. The relationship between what is not known about the way language is experienced as a cognitive process, and the significance of symbolic/linguistic representation as only a partially reliable basis for apprehension, comprises the mediated no-man's land which is poetry's specific precinct. Any poetry which does not enter into or partake of this interzone of flux and shifting apprehension, risks being prosaic and doesn't deserve the name. It's the area of dreams and suppositions and irrationality and the unknown, and it's also where words undergo transformation and evolve into newer shades of meaning, where language undergoes mutation and recombinant change, becomes, in effect, new avatars of signification. It may be, too, that the rebellious child or adolescent mind resists the given cultural paradigms by deliberately (or unconsciously) reconfiguring the language as a way of adopting it as his own, or as a statement of individuality (or alienation). Abstraction in language could be described, in some cases, as a bastion against received sense, or the imposed "wisdom of the past." Attempting to valorize such private (or hermetic) abstracts of language is one way to legitimize one's idiosyncratic separateness or eccentric outlook. The investigations or discoveries in artistic media may be regarded thus as part of a campaign against the collectivization of thought or behavior. 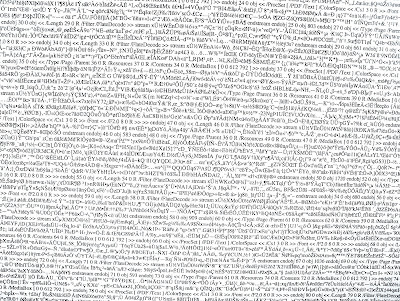 The language of the computer age could be seen, ironically, as part of a process of homogenization or regimentation of human thought and inquiry, or one unintended consequence of the globalization of discourse. Is this to be regarded as a favorable influence, of the democratization of peoples and cultures around the globe, or as an harbinger of a new authoritarianism spawned by technocrats looking to integrate communities into willing customer-bases or to manipulate them for purely political ends? Are we, as participants in the HTML-based media world of the internet, being subsumed into a global system of organization designed to align us into manageable constituents of the new world order? And if so, what would that order look like? 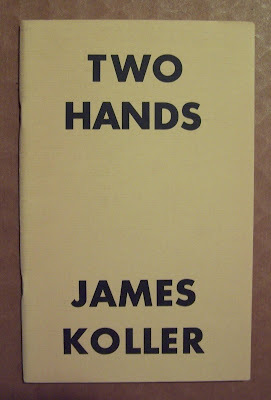 I first ran into James Koller's work back in the late 1960's. His poems appeared in a series of small, unassuming little pamphlets--Two Hands: Poems 1959-1961 [James B. Smith, Publisher, Seattle, 1965; Some Cows, Poems of Civilization and Domestic Life [Coyote, San Francisco, 1966]; and The Dogs & Other Dark Woods [Four Seasons Foundation, San Francisco, 1966], and then in 1971 Black Sparrow Press, Los Angeles, published California Poems. Some time in the early 1970's, probably in 1973, I wrote Koller a fan letter, something I've rarely done in my life. Koller, in the last-mentioned title, had evoked a rural feeling that struck a chord in my heart--it seemed like a book I might have written, had my life-path taken a turn or two closer to his. I'd grown up in Napa in the 1950's and early 1960's, at a time when the Napa Valley--along with the Sonoma Valley--was on the cusp of an explosion which would sweep away much of the charm and seclusion which had drawn the first wave of post-War Midwesterners and Southerners there. 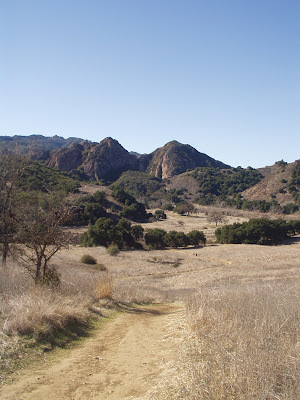 It was still possible, in those decades, to imagine what life might have been like in rural California in the latter half of the 19th Century, and the first half of the 20th--to conjure up an unspoiled countryside of live-oaks and grain-gold hillsides, criss-crossed with stone fences, dotted with well heads, and connected by train-routes. 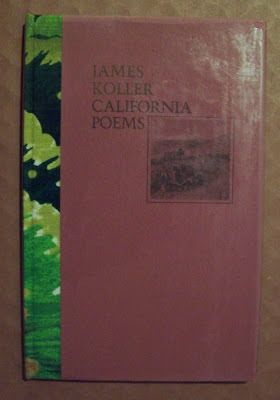 Koller's poems seemed to describe the edges of this world, and though he had come here as a transplanted Midwesterner in the 1950's, his feeling for the California landscape, for a world of semi-rural existence in which scraping along and getting by and making-do had been subsumed into the ambient aesthetics of the then novel ecological-populist movements, and given voice in a poetry that clearly owed more to Ezra Pound and Carl Sandburg than to T.S. Eliot or Wallace Stevens, which seemed to share a common aspiration with the work of Gary Snyder, Charles Olson, Drummond Hadley, Lew Welch, Jack Kerouac, Ted Enslin, Doug Woolf and others of the generation of the New American Poetry. Koller participated in the Berkeley Poetry Conference in July 1965, and would probably have been included in the Allen anthology, if he hadn't been so young (he was born in 1936). In 1964 he started Coyote's Journal, an avant garde little poetry magazine which defined a nexus of voices and concerns that paralleled his interests, and the underground cultural trends of the time; ostensibly started in reaction to the suspension of publication of the Northwest Review by the University of Oregon in 1964, that initial pretext would seem in hindsight to have been largely a symbolic impetus. What most distinguished it (the work) in my mind, then, and still does, was its sense of integral purpose, in which the life lived, the daily realities of work, love, and immediate sensory data were drawn up into the higher consciousness of meaning and purpose and given force in a most direct and simple style. I find it difficult now to speak of that time, the Sixties, without feeling some of the emotion which characterized it, for those of us young enough (or susceptible enough) to be swept up in the romance--intellectual, political, social--of that epoch. The dream-fantasy persona he uses has a semi-rural setting, consistent with the Sixties Hippie Culture of a return to the land, an awareness (or summoning) of ancestral identities (or deities), a faux-primitivistic evocation of animal spirits, the sense of community in shared interest and communal political consciousness. Most of the poems in Some Cows stretch their legs a bit more than this, as the individual phrases and stanzas begin to break up into dialectical islands of assertion, and the authorial presence (voice) becomes interactive rather than soliloquial. 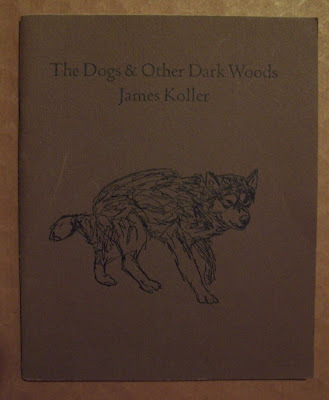 A lot of poets paid lip-service to the trends these poems address, but Koller was one of the few for whom they seemed genuine and immediate. I thought of him in those days--the late 1960's--as being a kind of minor Gary Snyder, not nearly so intellectualized and sophisticated, but rawer and perhaps more genuine--as if maybe Koller wrote the way, and lived the way, that Snyder might have, if he hadn't been a sort of perpetual graduate student in oriental studies. Snyder, of course went on to have a full career as an academic at UC Davis (now emeritus), while Koller seems to have steered clear of the academy. Nearly all the poems in this Four Seasons collection are set within the dream-state consciousness of pre-historic subsistence and intensity. Sexuality, animal archetypes (both confronted and assumed--in the shaman tradition), place the speaker at a frontier of "domestic" regard for the primitive. a specific resonance and inspiration. to dovetail separate apprehensions into a directed flow. selfishness and competition are beginning to impinge on The American Dream. colonials of the Bolinas township. Stopovers along the road. 1. From Two Hands: Poems 1959-1961, James B. Smith, Publisher, Seattle, 1965. 2. 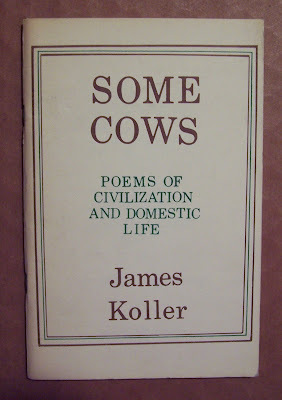 From Some Cows: Poems of Civilization and Domestic Life, Coyote, San Francisco, 1966. 4. From The Dogs & Other Dark Woods, Four Seasons, San Francisco, 1966. 6. From California Poems, Black Sparrow Press, Los Angeles, 1971.